Non-split corrugated tubing or unsplit corrugated tubing, also known as solid corrugated tubing from Quikcrimp or Narva available in sizes from 7mm to 47mm in 25m, 50m & 100m Rolls, supplied nationwide and delivered to your door. 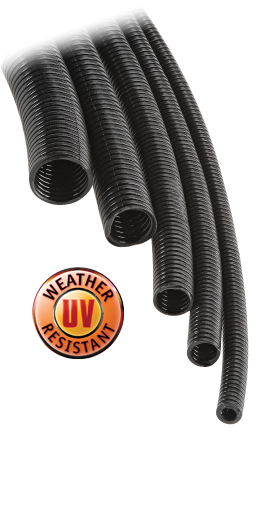 Harnessflex is black, flexible, nylon unsplit conduit and has the advantages of being able to withstand temperatures from - 40C to +120C for static use and -30C to +100C for dynamic use; able to resist many oils, solvents and petro chemicals*; is extremely tough, has a high impact strength and a long fatigue life; UV resistant; halogen free; flame retardant and available in a wide range of sizes. (*Full chemical compatibility and physical properties listing at the end of this section.) When used in conjunction with the extensive range of fittings and adaptors the Harnessflex system offers extreme versatility for both harness manufacture and general purpose applications, which can be made fully waterproof to IP67. 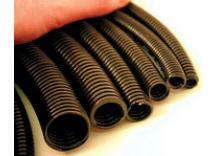 Conduit part numbers suffixed with A are manufactured in Australia and conform to Harnessflex performance standards. Narva's range of non-split corrugated tubing offers the ideal solution for keeping lengths of cable neatly and professionally organised. provides protection from abrasion, punctures, vibration as well as automotive fluids and high operating temperatures. Narva also has fitting that ensure a quality join or adaptation to your installation.